I am not an early adopter, but once I find something I like I am fiercely loyal. This was my trajectory with simple cleaning products. If you haven’t already made this switch, like 10 years ago, I’m here to say it’s easier than you think and yes, they work. You can see most of my kit in the picture. There are recipes for making your own laundry soap, but I’ve heard that they can be hard on fine fabrics, so I use a “green” commercial laundry soap. No dryer sheets—they coat your clothes and your dryer filter, and that coating can eventually cause your dryer to fail. No bleach—it’s not good for human or pet health or the environment, and like dryer sheets I consider it unnecessary. I do use a stain spray because I have a six year old boy and, yes, I totally cheated by not including that in the picture (it ruined the composition). Glass cleaner: mix 1/4 c. white vinegar with 2 c. water in a spray bottle (that’s an “official” recipe—I don’t actually measure); the vinegar scent quickly disappears and if I wipe sufficiently there’s no streaking. Boosting the surface cleaner: if you use bar soap (see my recommendation for an alternative to shaving cream), or have mildew on your tile grout, or for some other reason you need to scrub your sink, bathtub or tile, baking soda works well; spray surface cleaner or glass cleaner (vinegar kills mildew), sprinkle baking soda, and scrub away with a sponge or old toothbrush; of course there are mildew and soap scum sprays that allow you to skip most of the scrubbing, but over the long term they’re not good for tile or grout and they’re not good for human health. 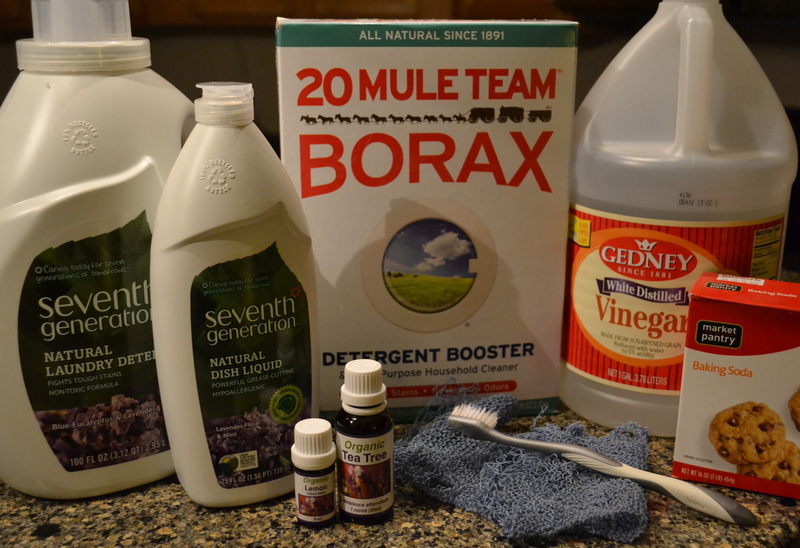 Toilet bowl cleaner: I use borax the way I would any other powdered toilet bowl cleaner, i.e. the borax crystals boost the friction power of the toilet brush and act as an antimicrobial agent. Unclogging the sink: you’ve probably heard that commercial drain cleaners can ruin your pipes if overused; a better alternative to removing the horribleness that prevents the water from draining is a saw-toothed piece of plastic designed just for this job. Oven: you know those oven cleaner sprays that smell so toxic–especially when heated–that you need to leave the room or house when they’re doing their job? yeah, toxic. I have an ordinary oven and, because of multiple bubbling over incidents, it needed to be cleaned. I used a plastic scrubber (that blue thing in the picture that originally had a ball shape), some baking soda and my spray glass cleaner, and some cloth rags I threw away when I was done. Because I am a careless/distracted cook, I should probably just line the bottom of the oven with aluminum foil (I found 100% recycled aluminum foil at my food coop). Surfaces: I use a clean dishcloth and a little soapy water. Garbage disposal: I run the disposal with a chunk of fresh or frozen lemon. Hardwood, laminate and tile floors: for normal dirt, I vacuum or use a dry Swiffer to pick up hair and other bits, then get on my knees with a cloth rag and warm water (wring most of the water out)—it’s more work than just going over the surface with a wet Swiffer cloth, but also more effective. I was told by a hardwood floor specialist to never use Murphy’s Oil Soap. I use a cloth rag. No spray. If you have other suggestions for simple, green cleaners, please share them! 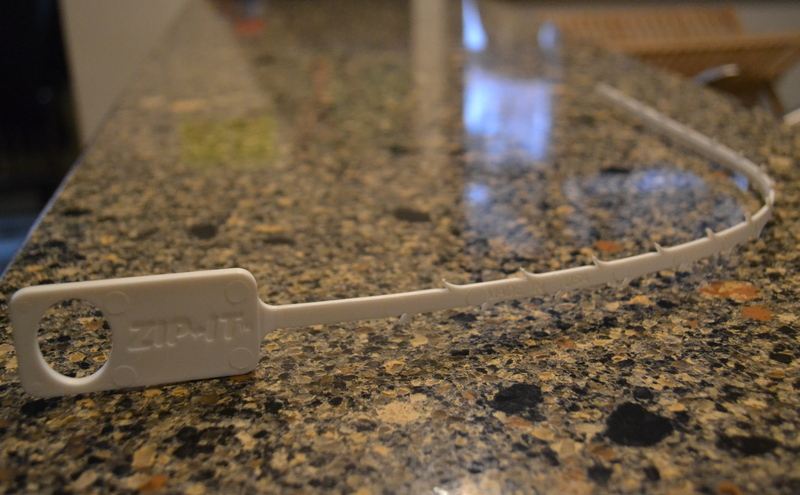 A few weeks ago I was tossing an empty can of shaving cream into the trash when it hit me: this metal can could be joining thousands like it in a landfill where it will take tens of thousands of years to break down (can they be recycled? I’ve never heard it discussed). I committed at that moment to finding an alternative to canned shaving cream.